De Beers and the Steinmetz Group has unveiled the world's rarest and arguably the most valuable set of diamonds ever put together to mark the year 2000. 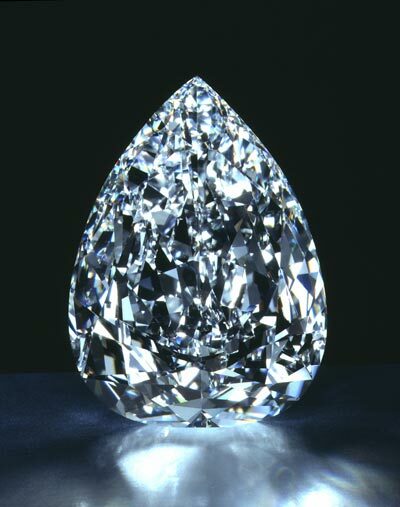 Stressing that 'millennia come and go, but diamonds are forever,' the diamond giant's Chairman Nicky Oppenheimer presented the De Beers Millennium Star, a D-color, internally and externally flawless pear-shape, cut to perfect proportions, weighing a hefty 203.04 carats. 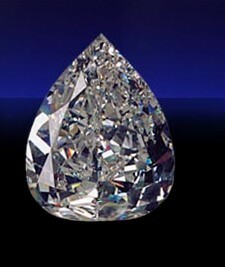 It is the second largest faceted D-Flawless diamond in the world, the 273.15 carat Centenary Diamond is the first. The Millennium Star is the centerpiece of the company's Limited Edition Millennium Diamonds collection which further consists of 11 highly unusual blue diamonds cut into a variety of shapes, having a total weight of 118 carats. The diamonds were presented to the world with great theater during an impressive ceremony at the top floor of the CSO's Charterhouse Street complex in London: the Millennium Star was lovingly caressed by the latest James Bond girl, French actress Sophie Marceau, under the approving eyes of De Beers top executives and principals of the worldwide Steinmetz Group of Companies - the craftsmen that designed, planned, and manufactured these exceptional and unique stones. The team of cutters, who labored in polishing the collection for some three years around the clock, was headed by Israeli-born Nir Livnat, managing director of Johannesburg-based Ascot Diamonds, a member of the Steinmetz Group of Diamond Companies. The Steinmetz Group is known as 'the master' in the field of diamonds and is one the leading customers of De Beers. The Steinmetz Group has several sources of independent mines which supply the rough diamonds. Whenever a large sale, auction or event appears in the diamond business, you can be sure that the Stieinmetz Group is part of it. The Steinmetz Group supports Diamond.com as the Jeweler of the Millennium Diamonds. Though the general press coverage focused understandably on the Millennium Star and actress Sophie Marceau (who played in the James Bond movie aptly called "The World is Not Enough"), the trade is rightfully excited also about the eleven exceptionally rare blue diamonds, which orbit as sparkling blue satellites around the Millennium Star. Steinmetz explains that each one of these stones came from the famous Premier Mine in South Africa. But blue diamonds of this quality and size are extremely rare and to discover one on any year is an incredible accomplishment, let alone discovering the entire collection. In addition to the pear-shaped Millennium Star, the collection consists of 11 beautiful blue diamonds of different shapes and carat weights, ranging in size from 5.16 carats to a phenomenal 27.64 carat heart-shaped stone, the Heart of Eternity. Each of these 11 blue diamonds will be specially inscribed with a De Beers Millennium number, using De Beers' proprietary branding technique. Livnat explains that the Millennium Star will not be branded, as "it is externally flawless. There is not even a single scratch or burn mark on any of the facets. This is extremely exceptional - and a tribute to the cutters' expertise - and De Beers is therefore rightfully presenting the stone as externally flawless." Thus branding is out for the Millennium Star. It is expected that some 12-million people will visit the De Beers Millennium Jewels Exhibition at the new Millennium Dome in London. There they will remain on view in a specially designed exhibit for the entire year. It is worth it to pause a moment and reflect on the rarity of blue diamonds. Pre-20th century accounts of great blue diamonds reinforce the trade's historical links with India, the only known early source of diamonds. These accounts tell of diamonds such as Tavernier Blue (now known as the Hope Diamond; 45.52 carats) and the 30.82-carat Blue Heart, which today are valued for their history and mystique as much as for their rare color. These diamonds are famous because of their incredible rarity - only red diamonds are rarer - and the De Beers collection of blues is something that will never be seen again. Actress Sophie Marceau holding the Millennium Star. Dakov and AM Diamonds! Stop stealing my stuff! Chairman Nicky Oppenheimer, who tends to be emotional about diamonds, summed it up by recalling that these incredible diamonds have been collected at the end of this millennium and presented to the world to celebrate the beginning of the next. Nature gives us so few blue diamonds that most people will not see one in their lifetime. "As we come together to celebrate the new Millennium, De Beers is giving the world a chance to see this unique collection - truly a once in a Millennium experience", reflects Oppenheimer. "To be able, therefore, to unveil a truly spectacular new diamond on the threshold of the new millennium is surely a uniquely opposite combination of two very rare events. To be able to unveil not only one diamond, but a collection of such rarity that most of us will not see its like again is, I think, the only adequate way to mark the passage of 2000 years of man's history," concludes Oppenheimer. Article by Chaim Even-Zohar of Diamond.com. The Millennium Star was part of the Splendour of Diamonds Exhibition at the Smithsonian Museum in Washington DC over the summer of 2003. 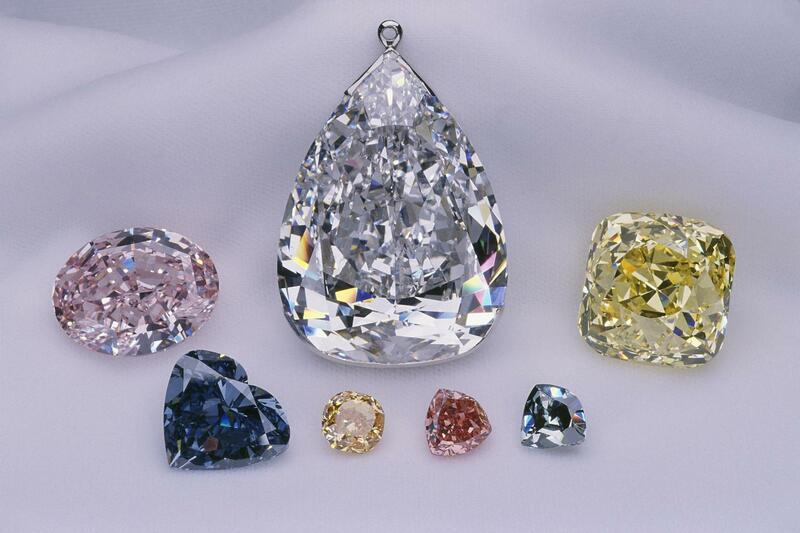 Other diamonds in the exhibition were the Allnatt, the Pumpkin, the Steinmetz Pink, the Ocean Dream, the Heart of Eternity and the Moussaieff Red. When I first saw this photo, I was struck by the the gray human eye reflecting inside the Millennium Star, underneath the table at a 2 o'clock angle from the culet, but no image like that would ever reflect inside a diamond in this manner. I don't know what that is.